The Sandbar Kitchen & Restaurant embodies what makes Amelia Island such a magical escape. It’s filled with beach-styled décor, right on point for a restaurant sitting on the water. The views are exceptional- the uninterrupted ocean and beach gloriously in full view. The live music oozes waterfront charm, with a nice mix of folk, rock, reggae, and singer-songwriter multiple nights a week. The setting itself oozes Old Florida design and decor. Relax indoors in the main dining room, head upstairs along the classic banister for an overview of the ocean views, or even get outside for some laid-back dining in the breeze. The Sandbar Kitchen & Restaurant is part sports bar, part cozy family restaurant. If the ambiance wasn’t enough, you have a rounded menu of seafood, burgers, and everything in between. A bit overwhelmed by having to choose just one option? You can always take an extra dish back home to one of our Amelia Island vacation rental homes for the next day if you can’t decide on just one. Thankfully, we did help narrow it down to what we see are the top three dishes at the Sandbar Kitchen & Restaurant. Looking for an epic burger on the beach? This is it. The 8oz Black Angus patty is coated in warm cheddar cheese and generous helpings of house-smoked pork and bacon. Finally, it’s topped with cinnamon whiskey BBQ sauce and onion strings and snug inside a toasted brioche bun. The BBQ Burger is a delicacy to some locals. The burger barely stands up on its own after it’s all said and done, which may be exactly what some burger lovers want! 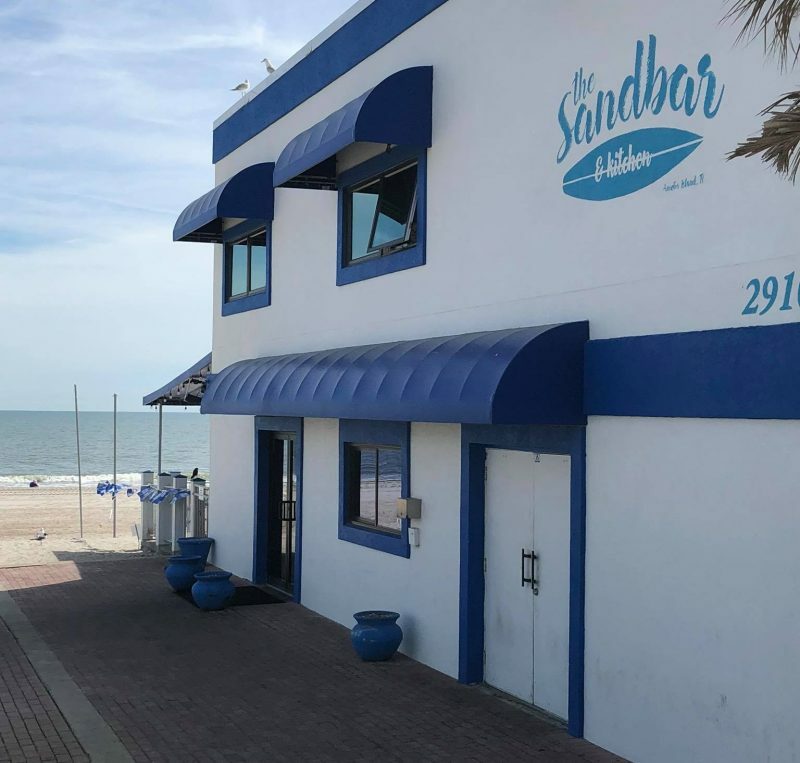 The Sandbar and Restaurant has about 10 different burgers and even more additional sandwich options if the BBQ Burger doesn’t exactly fit the bill. You can find the Key West Cuban, the Roasted Portobello, and a Grouper Sandwich, to name a few. Poke bowls are very popular now. After having one, you can’t help but wonder why it took so long. The Tuna Poke Bowl contains sushi grade Ahi Tuna, with a covering of sweet sou marinade over rice with seaweed salad. Top it all off with avocado and cilantro, and you have one of the best poke bowls in the state. You can always customize it a bit by substituting the Ahi Tuna for chicken or shrimp. The Poke Bowl is a new addition to their menu, but has quickly turned into one of the most popular selections. Both of the previous two signature dishes would fit in perfect for a nice lunch. But the fresh catch is the quintessential dinner dish for the Sandbar Kitchen and Restaurant. It truly is fresh- a rotating door of redfish, trout, flounder, tarpon, cobia, black drum, and more. The fresh fish of filet is served on rice & black beans, and delicately covered in mango pineapple salsa and beurre blanc. The selection is finally splashed with some diced cured cucumbers. The Sandbar Kitchen and Restaurant is one of Amelia Island’s premier places to eat. 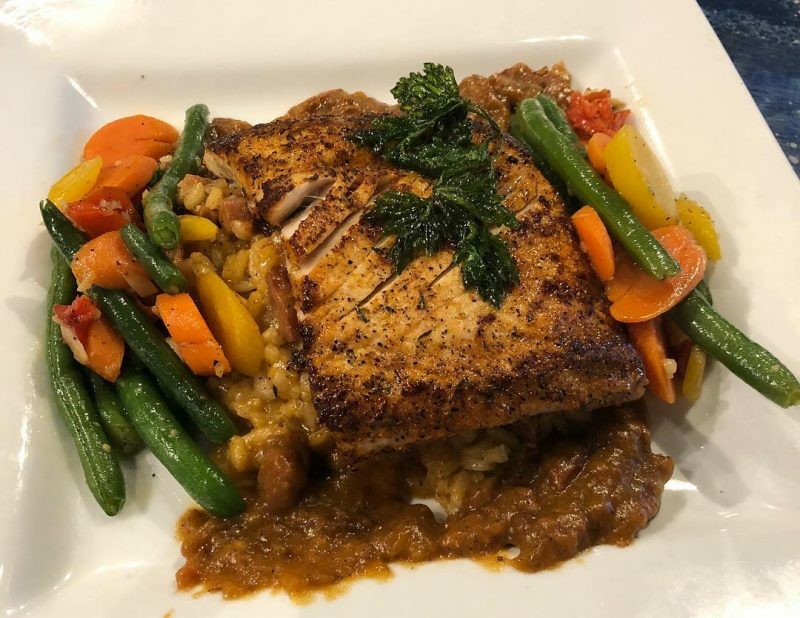 It has exactly what you are looking for from the island- a stunning view of the ocean, a cozy place to relax, and some excellent fish right from the coast of northeast Florida. Visit the website for more details about the various dishes, including the seven different seafood entrees, the six different pizzas, the 10 or more small plates, and the Pazookie, a hot and chunky chocolate chip cookie covered with vanilla bean ice cream. We have an assortment of different vacation rentals on Amelia Island, from bold condos by the water to multi-room and multi-level homes on the beach. We love Amelia Island, and we want you to love it too. Scan through our 163 different properties to see a dizzying collection of amazing places to stay for your next northeast Florida getaway.